The official dates of the Jubilee are from 7 November, 2015 (Feast of All Saints of the Order) until 21 January, 2017 (the date of the official Papal Bull Gratiarum Omnium Largitori of Pope Honorius III). For events of the Jubilee in your area, consult the web page of your respective Dominican Province. 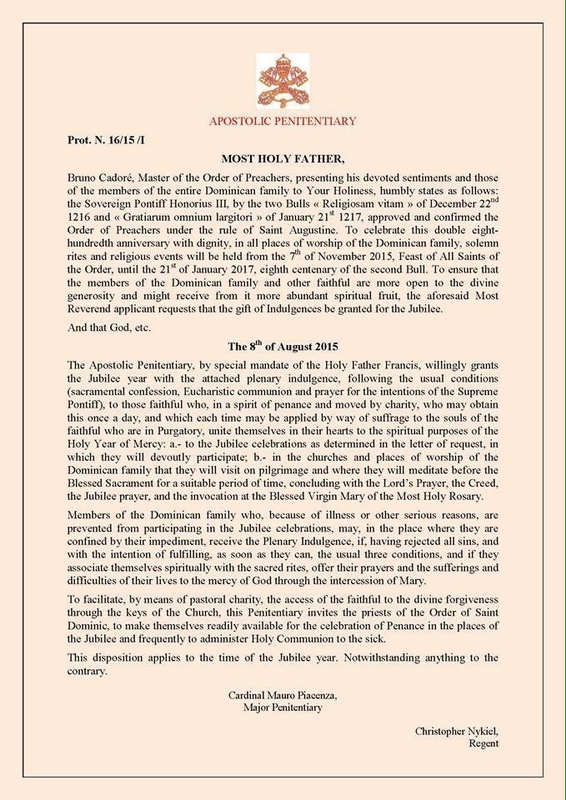 Dominican priests may wish to download the forms of Sacramental Absolution according to the traditional Dominican Rite available here and here. On the second of those cards, is included the addition to the form on the first card to be used during a Jubilee. Each download is two pages long. Print each double-sided, trim the card, and laminate it. They will fit easily into your wallet.